← Kids “most awesome” summer story contest! 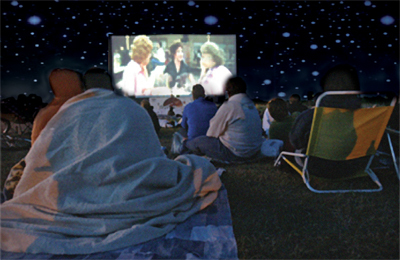 With the beautiful summer weather, why not enjoy the cooler evening air while watching a film or play under the stars? A number of a screening locations are available throughout the city. Enjoy some popcorn, a cool drink and your favourite movies under the stars. The screen is right down by the lake on the west side of the Natrel Pond, so keep in mind that it’s likely to get a little cool once the sun goes down. The theme for 2011 is “City Flicks”. Families are invited to bring their own blankets, folding chairs, snacks – even the family dog, as long as he or she stays on the leash. It can get cool so bring a few layers and also note, while there is an indoor rain location they’ll only it use if they really must, so don’t hesitate to bring an umbrella, too. This year’s movie theme is dancing in the dark, with many evenings offering a double bill. The Toronto Entertainment District BIA and the Toronto International Film Festival team up to present free classic screen musicals. In addition to family favourites they will also offer a sneak peek of TIFF Bell Lightbox’s epic Raj Kapoor retrospective with a screening of his classic film “Jagte Raho”. Movies In The Park offers a few free screenings during the summer in Riverdale Park East partnered with charitable organizations to help raise awareness of the organizations and to raise funds through screening sponsors. Regarded as one of Toronto’s favourite summer traditions, the 29th annual Canadian Stage Dream in High Park will feature William Shakespeare’s romantic comedy “The Winter’s Tale”, a classic play of two fairytale worlds brought to life with magic, mystery and music. All performances are pay-what-you-can with a suggested minimum donation of $20. Kids 14 and under get in free thanks to TD!